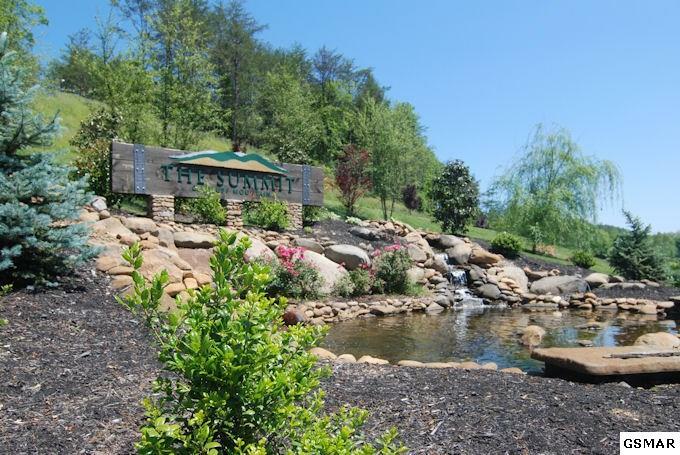 Located in Sevierville, The Summit at Bluff Mountain offers a respite from busy lifestyles. A small sign proclaiming the neighborhood’s name adorns an adorably landscaped hillside, complete with a small pond. Wide roads, nestled between river rocks, curve up the hillside. Breathtaking long-range views are a focal point, with mature trees providing privacy and immersing the resident in nature. This neighborhood offers winding roads, cul-de-sacs and underground utilities. County maintained roads lead to large driveways and unique homes. Lush landscaping, with shrubs, river rocks and a variety of trees provide privacy and give the neighborhood a cohesive feel. Old-fashioned streetlights at regular intervals provide just the right amount of light in the evenings without tarnishing one’s stargazing ability. Stone chimneys and lumber accents pay homage to the mountain setting, complimenting the views of the rolling fog-shrouded mountains. Well-manicured common areas provide ample green space. Large lots with lush green lawns add to the sense of nature that permeates the neighborhood. Large, stately homes have abundant windows to enjoy the beauty of nature that saturates the neighborhood. It’s easy to imagine curling up with a steaming mug of coffee and a good book next to one of the large windows, and gazing thoughtfully at gently falling snow between chapters. The large yards are ideal for an afternoon of tossing a football around with friends or family, or spending an evening stretched out on a blanket, gazing at the millions of stars and pondering all that they’ve witnessed. The Summit at Bluff Mountain offers an ideal escape from the chaos of life, letting you slow down and smell the roses while still being close enough to town to buy mulch for them. A home here has the convenience of living near amenities without the traffic or light pollution that comes with it. Are you interested in owning a home at The Summit at Bluff Mountain? There are several lots of various sizes currently available for purchase, some at a distressed price. If you aren’t sure if The Summit at Bluff Mountain is for you, we have many listings, from cabin to luxury vacation homes, in Gatlinburg, Pigeon Forge, and Sevierville. The Smoky Mountains are an ideal location for a permanent residence or a vacation home, and the real estate market reflects that. The Terrell Team can help guide you to the ideal home for you, and show you some amazing views along the way.